The Chinese automotive industry has arguably been the largest in the world since 2008, as measured by automobile unit production. Driven by immense growth in vehicle ownership - exceeding 200 million by the end of 2017 – the country also boasts a rapidly growing maintenance and repair sector. This year, the average age of cars in China increases to 5 years, the period when spending on aftermarket parts and services typically peaks. At the same time, the number of out-of warranty cars is expected to rise, further driving demand for aftermarket products and services. With an estimated 440,000 repair workshops distributed all over China, Chinese officials believe this repair demand will exceed capacity which means unprecedented opportunities for manufacturers, distributors, end-users as well as shareholders from the global repair and maintenance area. 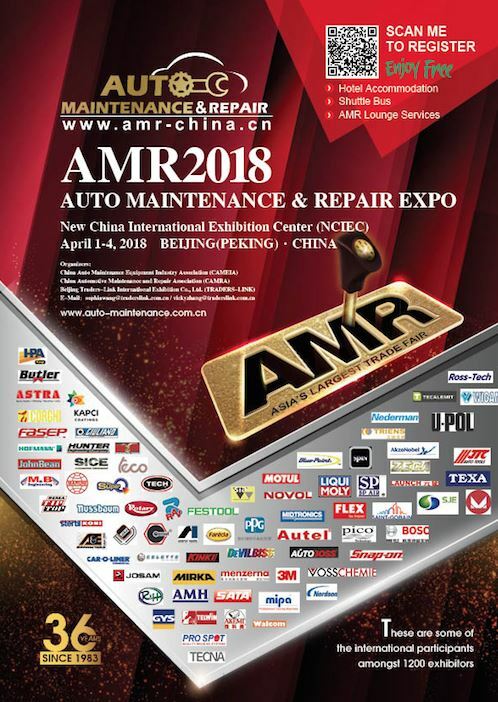 The organisers of Auto Maintenance and Repair Beijing 2018 see the event as a prime meeting place for members of the global industry to meet, interact and do business with their Chinese counterparts. Fast access for international key players in the automotive field to tap into the evolving repair and maintenance sector in China. Thanks to the recent JV between Messe Frankfurt (HK) Ltd and Beijing Traders-Link Plus International Exhibition Co Ltd., AMR will showcase even broader areas of the industry chain. Hall W4 will be set up to exclusively exhibit products regarding the car care, parts, accessories & products, with companies such as Liqui-Moly, Motul and Wep having confirmed their participation. The traditional maintenance and repair sector will be further enhanced in covering every aspect of the industry from collision repair, garage equipment, tyre related products, diagnostic & testing machines to car painting. Brands such as 3M, Beissbarth, Care-O-Liner, Corghi, Festool, Hunter and many more will again enthrall attendees with new additions Hunter, Snap-on, Kapci and Axalta. AMR2018 is estimated to increase the show scale to 1,200 exhibitors in 110,000sqm show space and welcome over 60,000 visits – including distributors from Mainland China of whom the vast majority are decision makers. It boasts over 30 featured events focusing on the industry new trends and hot issues will be held during the show, providing a unique opportunity for visitors to network and engage with the industry's top minds. Although the event is starting on the 1st of April, you can still finish your Easter eggs you can still fly out on Monday and see the show as it runs until the 4th. Pre-register through AutoForum and qualify for 2 free night accommodation! Get it sorted today and you will have enough time to get visas worked out too. And if you still need more reason to attend, Vodacom, Diners Club and Mastercard are all offering huge discounted rates if you book through them for Emirates flights.